MIAMI | In this era of text messaging and WhatsApp-ing, the handwritten note almost feels obsolete. But can the speed of an electronic message offset the personal touch of a handwritten note? For the students behind Bulldog Paper Designs at Archbishop Coleman Carroll High School in Miami, the answer is no. Valentine’s Day cards, Mother’s Day cards, Christmas cards are much more valuable, especially when they are made by their own hands. Four days a week, the special needs students in the high school’s Achieve program gather to make paper, notecards, and envelopes. Their project runs like a small business, one replete with academic as well as practical lessons. Around the school, students and faculty contribute to Bulldog Paper Designs not only as customers, but by placing discarded paper inside recycling bins located in 17 classrooms and offices. The remnants include expired event flyers hung in hallways, taped to lockers or pinned to bulletin boards. On “Recycling Fridays” — as dubbed by Bulldog Paper Designs — Achieve students visit each bin and round up the accumulated paper, whose colors match those of the rainbow. No color is left behind. Every color gets used. In paper making, blotting is a must. With sponges in hand, juniors Briana Cruz and Nicholas Pardo blot and dab the excess water from the recently made paper. 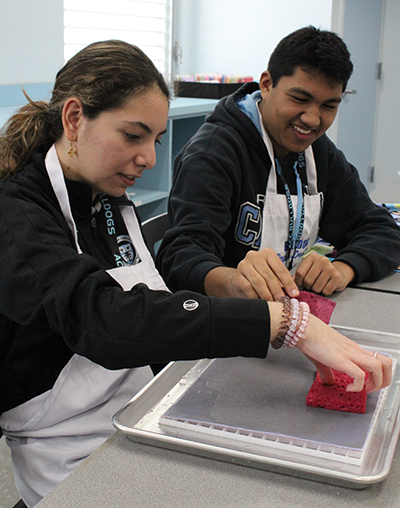 Eileen Font, a retired teacher turned volunteer with Achieve, noticed the value of the different paper colors when she first introduced the paper-making project to her students. White wasn’t cutting it. “We were getting this awful color. It was dingy,” Font recalled. A former student who colored with crayons and had a talent for blending them helped to develop the formula for mixing the multicolored paper pulp, one that Font describes as “trial and error” with every combination. This day, they’re making envelopes, which requires mixing two sheets of crayoned paper and six envelopes. 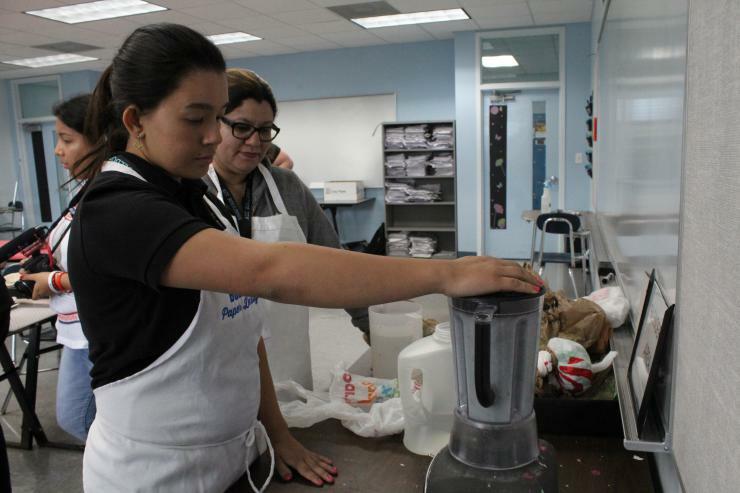 “You have to put all of the paper in and it has to be in little pieces,” said Carla Paolini-Perez, also a junior, as she prepped the mix for the blender. She poured five cups of water into the blender and started it, filling the classroom with a grinding ruckus. After several seconds, the consistency turned pulpy and sloshy. She handed off the contents to Mainardi, who was waiting at the hand mold station. The hand mold has a deckle, or wooden frame, about three inches high, with a stencil at the bottom – in this case in the shape of an envelope – which sits over a papermaking screen and support grid. The hand mold is placed into a clear rectangular bin filled with water. As the pulp is poured into the deckle, Mainardi gently puts his hands in, swirling the pulp around to make sure it is evenly distributed. After a few seconds he lifts the entire deckle out of the water and the excess water cascades into the bin. “It looks like speckled stardust,” he said of the mix, a light bluish-grey color base with flecks of dark blue. Next to Mainerdi, junior Alexis Roman is working on another, slightly smaller deckle that has the stencil for making cards. Her pulp mix contains eight sheets of colored paper and five cups of water. “I like to make the blue ones,” she said. A closer look at the rolling and imprinting of a flower design to a sheet of paper. 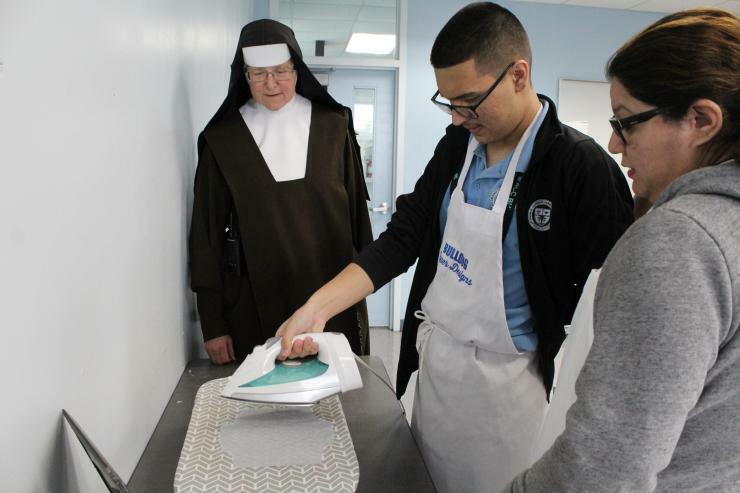 Once the papers are shaken dry at both stations, they are handed off to the blotting station where juniors Nicholas Pardo and Briana Cruz await with sponges and cover screens. The cover screens and blotting help remove excess water, but this is the longest part of the process. "In papermaking, there is no mistaking,” chimed in Cruz. Johnny Nepa, the only freshman in the group, watches them while waiting his turn to work. The next step is to place a coat paper over the drying paper. Nepa will press and hold the paper down as Pardo flattens it with a rolling pin at a very deliberate pace. “One, two, three,” Nepa counts softly, his attention completely focused. Afterward, the paper is either taken to a final drying station that involves ironing, or, in the case of cards, an additional imprint station where daisies, roses, and other flower designs are rolled on. About a half hour before the school bell rings, the students begin to tidy up in preparation for closing. This year, Bulldog Paper Designs did not sell cards on Valentine’s Day. 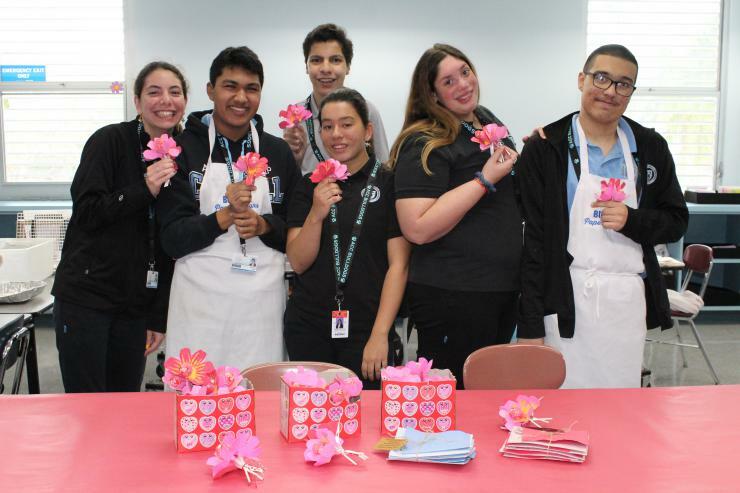 Instead, the class distributed lollipop bouquets, with flowers made from paper and painted by hand, and a thank you note to faculty members who have supported them. The student business is gearing up for Mother’s Day – their next big card-selling holiday. Video credits: Izzy Rennella, producer; Cristina Cabrera Jarro, videographer. Mixing things up in the blender is Carla Paolini-Perez, a junior at Archbishop Coleman Carroll High School and one of the creators behind Bulldog Paper Designs, a paper and card making project at the school. Supervising is her teacher, Michelle Corona. In paper making, blotting is a must. With sponges in hand, juniors Briana Cruz and Nicholas Pardo blot and dab the excess water from the recently made paper. 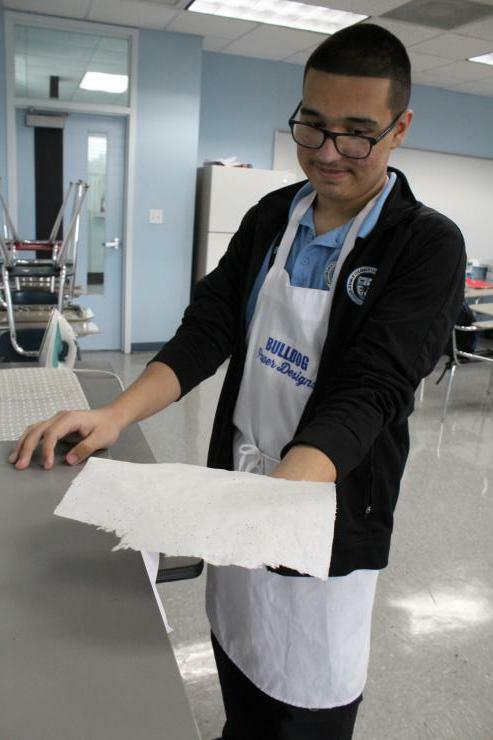 Let's roll: Junior Nicholas Pardo rolls a rolling pin as freshman Johnny Nepa holds the paper securely and keeps count. This process in papermaking presses out excess water and flattens the paper. Ironman: Carefully, Jasen Mainardi holds an iron over the freshly made paper. The heat from the iron will help in the final drying of the paper. Watching him are Carroll High's principal, Carmelite Sister Margaret Ann, and teacher Michelle Corona. Jasen Mainardi shows the final product, a pressed and dried sheet of paper. From there, the edges will be trimmed, and it will be folded into an envelope. 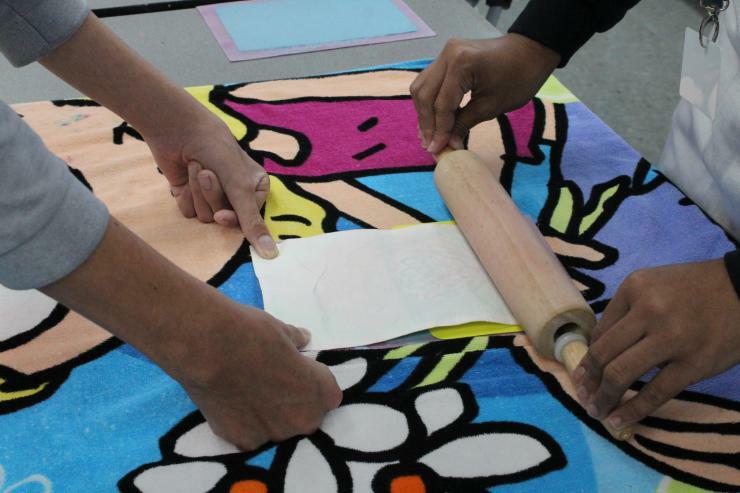 A closer look at the rolling and imprinting of a flower design to a sheet of paper. The Bulldog Paper Designs team spreads some love with handmade cards and Valentine's Day bouquets, made from hand-painted, hand-made paper flowers, and a Tootsie Pop center. From left to right are Briana Cruz, Nicholas Pardo, Johnny Nepa (back), Carla Paolini-Perez, Alexis Roman, and Jasen Mainardi.